This December, Bristol-based vegan charity Viva! is hosting the Bristol Viva! 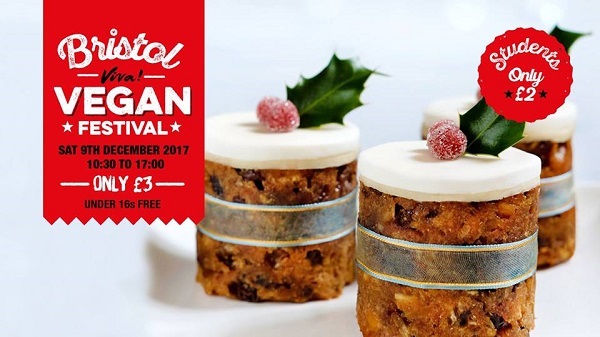 Vegan Festival at the Bristol Student Union on Saturday, December 9th. The venue, in the Richmond Building on Clifton’s Queens Road, will feature over 90 stalls of vegan food, clothes and vegan and ethical gifts, with entry priced at £3 per ticket – or £2 for students. VIP tickets will also be available, and these ticketholders will benefit from queue-free entry and a VIP goodie bag. There will also be a vegan bar on the day, along with a kids’ zone to keep children entertained. What’s more, talks and cookery demos throughout the day will give visitors the chance to learn something new, no matter how long they’ve been embracing the vegan lifestyle. Interested? Online ticket sales weren’t available at the time of writing, but keep checking the Tickets page of the festival’s website to find out how you can get your hands on yours.